The palatal expander expands, or widens, the upper jaw by putting gentle pressure on your upper molars each time an adjustment is made. 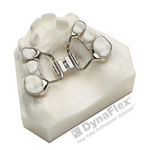 Your orthodontist will instruct you about when and how to adjust the expander. During expansion, you will feel pressure in the sinus area around the nose and below the eyes (just like if you have a cold). This pressure usually lasts a day with the first activation of the device. Future activations bring a pressure lasting only a few minutes. Soft foods and pain relievers, such as Advil or Tylenol, can help reduce any discomfort you may feel. After the desired amount of expansion is achieved, the expander must still be worn for approximately six months in order to solidify the movement and prevent relapse.